The Cannon County High School football team opened the 2015 home portion of their schedule on Aug. 28 against Jackson County. It was also throwback night as the Lions wore jerseys from back in the day honoring those former players in program history. However, the Blue Devils shutout the Lions, 47-0. "I think specialty games like this are a fun thing to do," senior lineman Eldon Resko said before practice last week. He wore No. 50, which is his normal jersey number, in honor of Gary Northcut. Some of the players wore different numbers than normal during the game to honor those famous former players who wore them back then. "It is pretty exciting and we have not done anything like this in a long time," Senior lineman Bo Bryson, who wore No. 40 instead of No. 10 in honor of Mark Roberts added. The home opener was also the debut for the CCHS football team with the new lighting system at Fred Schwartz Field. Several other sporting events have taken place since the lights were put in last year, but this was the first high school football game under the new lights. "These projects are advertised for bid, then bids are approved by the school board at a regular meeting," Cannon County Director of Schools Barbara Parker said via email on Aug. 28. "The football stadium lighting project was a project that the school board felt was badly needed, and the board included funding for this project in the budget for the 2014-15 school year. The former lights were given to CCHS and had been used for many years and did not lighten the field as much as were desirable." As for the game itself, the Lions got off to another strong start on their first offensive possession as they drove down to the JCHS 6 taking up most of the opening quarter. However, senior placekicker Livia Walker missed a 24-yard field goal with 4:30 left in the first. It was the only scoring opportunity of the night for CCHS. In the meantime, the Blue Devils miffed a punt in CCHS territory on their first offensive possession, but two plays later the Lions fumbled the ball back to them. JCHS running back Colby Long punched it in from the CCHS 2 with 9:06 left in the first half, and they added one more touchdown before the break when quarterback Tyler Boling connected with Wesley Punzalan from 15 yards out to give them a 13-0 advantage at halftime. In the second half, the Blue Devils took control of the game as they scored five more touchdowns to end the game. Long ran for three of them with Caleb Wall returning a fumble back on a kickoff 25 yards for another score, and backup running back Chris Wilson added the final one of the night. Long finished the night rushing 17 times for 163 yards and four touchdowns. The Lions dropped to 0-2 on the season, and the last time they were shutout was Oct. 10, 2014, 61-0 against Livingston Academy. 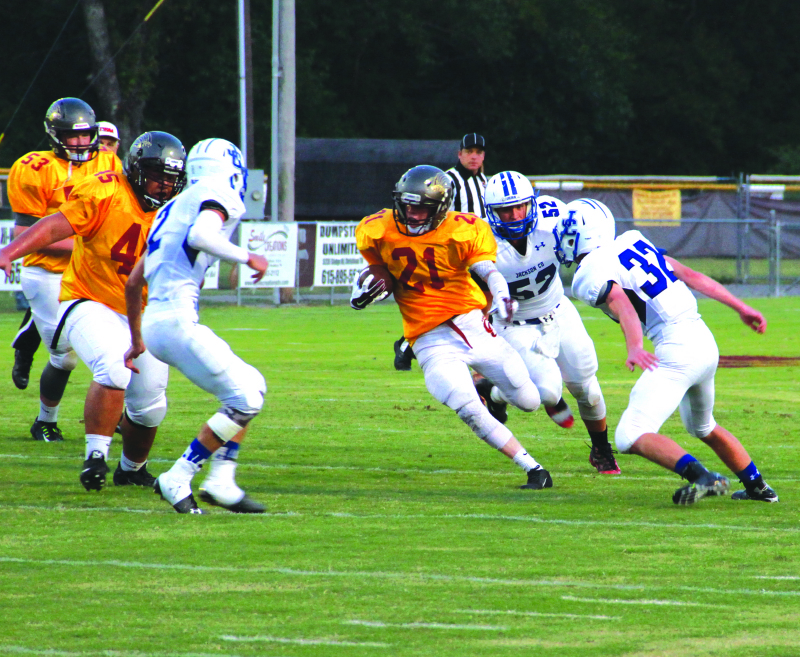 However, CCHS followed it up with a win over Smith County during the next week. This Friday, CCHS travels to Grundy County at 7 p.m. Here is a list of the Throwback Jerseys from the Aug. 28 game.